In urban areas, high voltage underground cables are commonly used for the transmission and distribution of electricity. 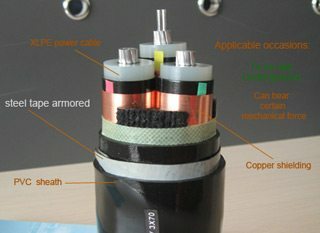 Such high voltage cables have metallic sheaths or screens surrounding the conductors, and/or armour and metallic wires surrounding the cables. During earth faults applied to directly earthed systems, these metallic paths are expected to carry a substantial proportion of the total fault current, which would otherwise flow through the general mass of earth, while returning to system neutrals. These alternative return paths must be considered when determining the extent of the grid potential rise at an electrical plant due to earth faults. For safety and reliable operation, the shields and metallic sheaths of power cables must be grounded. Without grounding, shields would operate at a potential considerably above ground. Thus, they would be hazardous to touch and would cause rapid degradation of the jacket or other material intervening between shield and ground. This is caused by the capacitive charging current of the cable insulation that is on the order of 1 mA/ft of conductor length. Cable screen controls the electric field stress in the cable insulation. It also provides return path for cable neutral and fault current. If the screen is earthed at two ends than it provides shielding for electromagnetic radiation. Enclosing dangerous high voltage with earth potential for safety. It provides low impedance fault current return path and provides neutral point for the circuit. It also provides shielding of electromagnetic field. Electromagnetic coupling between the core and screen Electromagnetic screen. If the cable screen is single point bonded, no electrical continuity and mmf generates a voltage. If the cable screen is bonded at both ends, the mmf will cause circulating current to flow if there is electrical continuity. The circulating current produces an opposing magnetic field. Suitable bonding method should be employed to meet the standing voltage limit and keep circulating current to an acceptable level. This type of Formation minimizes the sheath circulating currents induced by the magnetic flux linking the cable conductors and metallic sheath or copper wire screens. This configuration is generally used for cables of lower voltages (33 to 132kV) and of smaller conductor sizes. The trefoil formation is not appropriate for heat dissipation because there is an appreciable mutual heating effect of the three cables. The cumulated heat in cables and cable trench has the effect of reducing the cable rating and accelerating the cable ageing. I would like to know the formula of leaking current on the copper wire screen? For one cable (1×500sqmm) 22kv. How about spec of this leaking current? 132kV Cable laid from one station another station with 1.5 km distance, in this case, i need to Earth the shield one side or both side what is the reason. b) The earthing conductor size can vary from 95 sq. mm to 400 sq. mm. It is normally copper. What should be the optimum size. c) are SVLs used in Link boxes available in higher ratings than 10kA. will be obliged for your advise. sir i want to know how safe are the cables laid underground in front of my home by the mobile towers employees as the 11kv main line and transformer are near by my home???? Suppose if I am laying 132 KV HT cable and I want to introduce cable link boxes. What will be additional requirements to connect cable sheath link boxes. What sizes of connecting cables required? After how much length of 132 KV cable 1 no. link box is advisable. In case of flat formation, why continuous current rating of cable is reduced in both end bonding method as comparison to single point bonding method?? 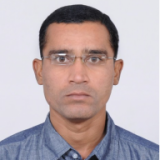 I would like know how to calculate 500KV OHL tower earhting ( Combination of earht road and bar copper conductor/wire) in order to achieve required earth resistance. Kindly provide me the detailed calculation.